Killington reported its first frost this week, Colorado had its first flaks and in NYC hoodie weather has officially commenced. In a rider’s mind that all means one thing, snowboarding season is about to drop! There are a few events on the radar over the next couple of weeks you’ll want to make your way over to. With a title that’s, ummm… awesome! You can expect nothing less from the flick. Check out the teaser here and you’ll know what I mean. The Flick has a got a tri-state tour and will be starting out in Brooklyn hosted by Homage at their indoor skate park. Provided will be all the necessities for a good time: beer, Monster, raffles and talk of the pro’s making an appearance. Don’t miss this on Friday 9/23. 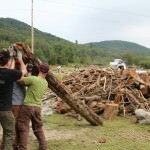 If you love Vermont as much as we do, and you’re wondering how you can help them recover from the insane devastation that Irene has left them with (check out our latest situation update! Go ahead, I’ll wait) Ok you’re back and ready to help? There’s still time to email RSVP@OvRride.com to hold a spot on the bus to Stratton next week (9/30-10/2). Any and all help is appreciated and specialized skills and contracting background is especially useful. Oh and did I mentions, all expenses are covered. Find out more by clicking here. The next couple weeks seem to be quite, but there’s a few events being lined up that might change all that! We’ll keep you in the loop, just keep on eye on OvRrride, here on the blog, on Facebook and Twitter @OvRride! This entry was posted in Film, Video, and Media, Lara's Blog, News. Bookmark the permalink.